Hikers are greeted with alpine country within a few hours of embarking on the Skyline Trail, which boasts the highest average elevation (its highest point is 8,238’) of any trail in Jasper, Alberta. At about 27 miles long, it’s remote enough to offer a real backcountry experience, but it’s short enough to be completed in just two or three days. It’s super accessible too — the trail ends just 10 minutes’ drive from downtown Jasper. Its well-trodden path snakes through alpine meadows and skirts along ridgelines, offering both peaceful serenity and an exciting sense of exposure - making it the perfect endeavor for anyone who seeks to answer the mountains’ call. Full Disclosure: Travel Alberta hooked us up with a Jeep for the week so that we could move freely throughout the province (little did they know we’d be sleeping in it too), while Tourism Jasper took care of our permits and campsite fee for the Skyline Trail, ensuring we could just show up and hike. Gil and I had arrived in Jasper the night before, after a stunning drive up Alberta’s famous Columbia Icefields Parkway from Banff — where I had just wrapped up training alongside the pros at GoPro’s Athlete Camp. It hadn’t taken us long to discover the goodness that is Tim Horton’s; we stopped in for the second time in eight hours to grab breakfast and snag some WiFi before heading to the Skyline’s north trailhead to catch a shuttle to the south one. We met another couple of hikers who were there to experience the same journey — but before long all four of us were frantically checking our watches and exchanging faces of concern. The shuttle was fifteen minutes late. And then thirty. It seemed as if we had missed our ride. A call to the shuttle service revealed that we were at the wrong pickup point, mere minutes from the correct one. They had a tour stop at our location though and would pick us up within the hour. By 11 am, Gil and I were on the trail and hiking quickly to make up for lost time. We’d be covering the entire trek in (less than) two days and one night. Fortunately, the trail was well-groomed, the elevation gain was mild — and within a couple of hours swaths of evergreen firs had been replaced by golden meadows that were speckled with dabs of red, green, and orange. The trail lazily meandered before us, without ever gaining or losing much elevation — yet the alpine scenery never ceased to amaze. The La Sportiva Synthesis Mid GTX ($145) provided plenty of protection for Gil’s feet, in a package that’s capable of moving fast and light over just about any terrain. We briskly strolled through meadow after meadow as the valley progressed northward, encountering several stream crossings along the way — each as cool, calm, and inviting as the one before. As the day progressed, clouds began to roll in — filling the sky with varying monochromatic shades that blocked all but the most persistent rays. As we continued on, those clouds delivered the lightest snow flurries and winds — absolute perfect conditions for hiking in. After a short climb, we reached a junction in the trail. The path to the right presumably led to the Watchtower — a different trail that was not on our agenda; the one that continued straight would inevitably lead us to our stop for the night: Curator Campgrounds. As it turned out, the trail we took was now defunct; as we continued along the path, our route quickly became a cross-country affair. Fortunately we had a topo map of the area; before long Gil and I were dropping elevation down to a grove of trees, having spotted tents from above. All hikers on the Skyline trail are required to camp at pre-booked, designated backcountry campgrounds. The Curator Campgrounds are located just shy of the halfway point when going south to north; and just before reaching The Notch — which is the trek’s highest point at 8,200 feet. Thanks to our late start, most of the first-come, first-serve campsites were full, but we were still able to nab one nestled in the back near some firs. All of the campgrounds we encountered along the trail had pre-built bear hangs, picnic tables, and pit toilets — and the Curator was no different. By the time Gil and I stopped for the night, snow had begun to fall at a much more accelerated rate than before so we wasted no time setting up our Hyperlite Mountain Gear UltaMid 2 pyramid shelter to escape the inevitable encounter with Canada’s first sign of winter. Hyperlite Mountain Gear’s cuben fiber stuff sacks ($14-37) made for the perfect lightweight bear hang bags. While I was setting up guylines for the UltaMid, Gil got to work boiling water for our Backpacker’s Pantry Risotto with Chicken (by far, my favorite variety of the freeze-dried fare.) Not wanting to endure the approaching night for longer than necessary, we scarfed down our food, set up the bear hang, and crawled into our cavernous shelter. Lights out. We awoke early the next morning to the stillness of the season’s first snow. Several inches of the white powder covered everything in sight. After a breakfast of hot oats, Gil and I packed up camp and headed back out on the trail. There was a lone man who left the campgrounds before us; we could see his silhouette against the white mountains up ahead. As we rose up out of the forest, signs of the path became less defined; before long we were breaking trail through the freshly fallen snow. The Notch was our next objective; we could see it up ahead. Gil and I continued toward the pass, but the man whose tracks we were following disappeared over a ridge that was clearly off-track. We hoped that he knew where he was going as we steadily gained elevation over a field of scree until we reached our objective. The Notch offered expansive 360-degree views out over Jasper; nearly everything was covered in white. We began dropping down the north side of the pass and then followed the subtle contours of the mountain to our right. Eventually we reached an exposed ridgeline, which we followed for the next several hundred meters. The Dynafit Vulcan Hooded Down Jacket ($279) uses DownTek and the Westcomb Switch LT Hoody ($450) uses Polartec NeoShell - both of which did an exceptional job of keeping Gil warm and dry despite some pretty gnarly weather conditions. Weather was fierce along the ridgeline; as the temperatures dropped a chilly wind blew. Using our trekking poles for stability against the wind, we continued on. Spindrift limited our visibility, but a series of large cairns reinforced our route-finding abilities as we traversed the barren landscape. Eventually we caught a glimpse of the trail snaking through a valley below, so we continued trudging along with a newfound vigor and sense of purposeful direction. Down low, the snow had already begun to melt, creating a muddy mess — but the sun’s warm rays were a welcomed departure from the icy tundra we encountered up high. As Gil and I continued ticking off the miles, the sun’s work continued too; before long winter had seemingly passed, receding its possession of fall. Almost too quickly, we reached the trail’s end. The adventure was over — but our week in Jasper was only beginning. Because the Skyline Trail is a point-to-point, arrangements for pickup must be made at either the start or the finish. Your best bet will be to tackle the trail from south to north. Leave your car at the north trailhead, and then take the 9:15 am Maligne Valley Direct Shuttle ($30 p/person) to the south trailhead to begin your hike. The shuttle ride will take about 45 minutes; it drops you off right at the trailhead, so you should be able to start hiking by 10 am. The north trailhead parking lot where the shuttle picks up is kind of hard to find because it’s unmarked from the road. Here it is on Google Maps so you don’t get lost and miss your shuttle like we did. Backpacking gear. Need advice on how to pack your pack? Check out our latest Wild 101 video. 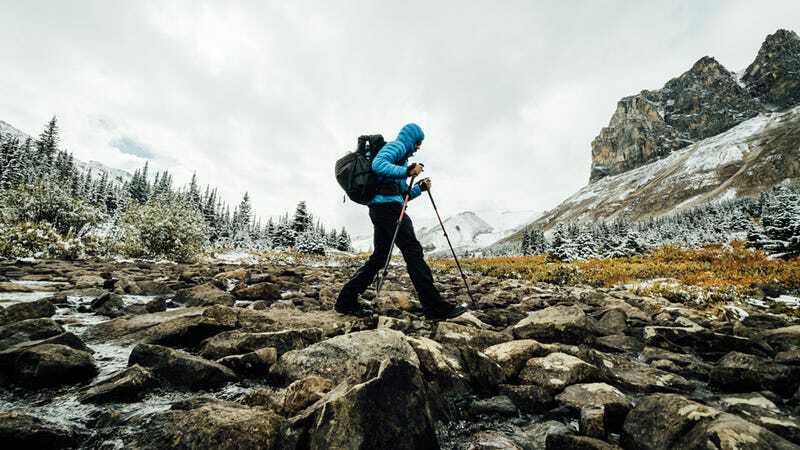 Bring a good rain jacket, dress for the cold, and be prepared to sleep in it too — weather can change quickly in the mountains, especially as far north as the Canadian Rockies. Hiking the Skyline Trail requires a permit; it’s a popular trek — so make sure to reserve yours plenty of time in advance. You’ll also need to reserve a designated campsite for each night you intend to stay on the trail. Grizzly bears also roam these parts, so be sure to pick up a can of bear spray — and have it on your person at all times. It’d also be a good idea to research how to handle a grizzly encounter. There were plenty of running water sources along the trail so you shouldn’t need to carry much. As always, treat any water you find outdoors. There were so many scramble-worthy peaks along the Skyline Trail. If we had more time, it would have been great to spend an extra day on the trail to do some peak scrambles along the way. There are a couple books available in the Friends of Jasper gift shop in downtown that provide data, but a lot of them looked easy enough to onsight too. Canyoning with Maligne Adventures was Gil’s favorite part of the entire week. What else should you do while you’re there? Jasper is an outdoor adventurer’s paradise; we spent a week doing everything from canyoning to canoeing to climbing. We even made an attempt on Mount Athabasca. That story’s coming next. About the Author: Chris Brinlee Jr. is an adventurer and storyteller who can’t stay put for more than a few weeks at a time. Follow his current adventure in Nepal on Instagram:@chrisbrinleejr.